Every technological advantage that fishermen have today is available because of early pioneers. In the realm of braided fishing line, it was Western Filament, Inc. that set the standard. Founded in 1938, they developed the first Tuf Line UHMWPE braided line. The original salt and pepper colored braid is stronger than ever and marks the base in a series of newer Tuf Line products. Discover its abilities in the following Tuf Line Classic Braid review. 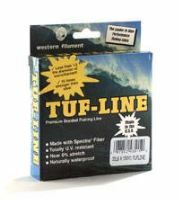 Product: Tuf Line Classic braided fishing line. Price: Middle to high middle range. 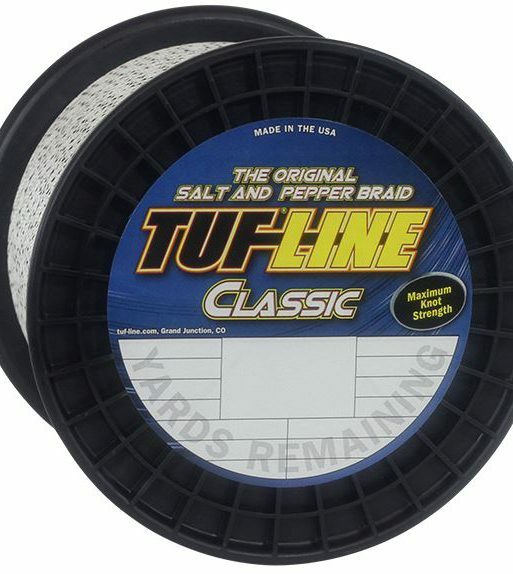 Tuf Line Classic is the original braid by Western Filament, Inc. It comes in the very first salt and pepper color that blends so well in so many waters. With line tests as light as 15 lbs and as heavy as 130, Classic Braid fits a wide range of offshore reels. Western Filament uses the most advanced techniques in braided line today. They manufacture all spools in the USA under strict quality control guidelines and Tuf Line is still an angler favorite. Note: Availability of spool lengths and tests depends on current stock levels. Classic Braid is 40% thinner than their equivalent mono counterparts. This means you’ll load many extra yards of braid on your reel without sacrificing any strength. Looking over the line diameters, it’s easy to see how much thinner it is next to monofilament line. A term that simply means impervious to water, Classic Braid by Tuf Line won’t become waterlogged. When braided line absorbs water, it becomes heavy which can have disastrous effects. Wet braid is more likely to knot when casting and it increases in thickness, worries you don’t have to deal with using Classic Braid. True breaking strength braids such as the Daiwa Samurai won’t hold up past their test rating. Most braided fishing lines have a breaking point above they test ratings they apply. Tuf Line Classic has that generous quality and more of it than many brands do. They are one of the few labels that actually lists the higher breaking rates. In the original style, Classic Braid keeps with tradition by manufacturing their first color. By weaving alternating black and white strands, the braid achieves a final salt and pepper appearance. It’s a pattern that blends well in most waters, working as camo by changing the colors of the braid. Tuf Line calibration shows their Classic Braid to have a stretch capacity of 4 percent. That’s almost nothing in comparison to monofilament, and anglers can feel the sensitivity it brings. Classic Braid responds to the smallest strikes and it’s also abrasion resistant. It makes use of Spectra fiber, one of the toughest materials on earth. With so many braids on the market using similar materials, Tuf Line makes their mark in quality. The base of all Tuf Line braids, the Classic weave offers the same commitment to excellence that appears in all their products. Western Filament, Inc. manufactures all Tuf Line braids in the USA with the utmost attention to detail. Staying on the more affordable side, Anglers can benefit from the assurance of Tuf Line with the standard Classic Braid. As the base product in the Tuf Line series of braids, the Classic is an all-purpose fishing line. It doesn’t have any special features that make it better for casting or thinner than other braided lines. Tuf Line presents their XP, Domin8, and 4orce braids with enhanced features for more specialized applications. Braids such as those by Power Pro, Sufix, and SpiderWire have their own specialized options. Classic Braid by Tuf Line is a standard braid, albeit one with quality construction. It’s perfect for everyday use because of its durability and affordability. For your beginning angler, Classic Braid makes for easy handling. You won’t have to worry about line failure when you’re battling a larger model or dig as deep to replace the line. Use the original salt and pepper to blend in with any watery environment, salt or fresh. Supply it as the choice for your trolling reels or any other set up that may take a beating. The Classic weave provides excellent knot strength either straight to your hook, as a mono backing, or with a fluoro leader. Like the vast majority of braided lines, Tuf Line doesn’t back the product with any sort of warranty. Check with each retailer for info on their return or exchange policies. Tuf Line does, however, value each and every customer and asks for their feedback online. A visit to the Tuf Line website will bring you to their Contact Page. They also have a Resource Center where they answer FAQ’s and have videos on knot tying. Tuf Line is consistent across the board and well-known for manufacturing high-quality braided lines. Their Classic Braid may be the base, but it still offers the Tuf Line standard of excellence. Without any enhanced properties, it still scores close to the ninety percentile. It has a quality that surpasses brands like Hercules and KastKing, at a value that exudes confidence. 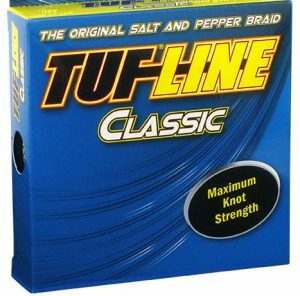 What are your experiences with Tuf Line Classic Braid? Do you have any questions? Please leave your mark in the comment section below. Help another reader or ask for info yourself. Thanks for tuning in and tight lines until next time, FishtFight.com.